Several weeks ago we launched, with little fanfare, a new blog post series we're calling "Tech Talk Tuesday," or T³. Each Tuesday, Shawn, Sarah and Nick will take control of the blog and talk about...whatever they want, really. 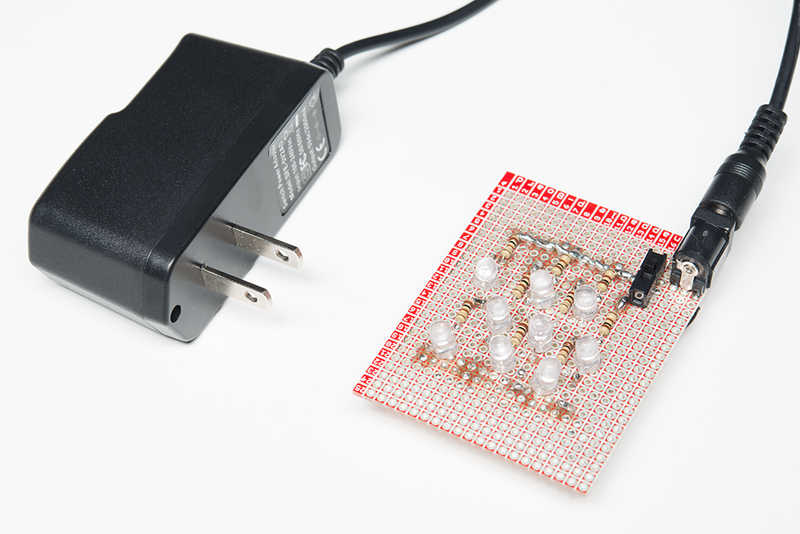 From projects, to current events, to teardowns, to electronics concepts, we've given them free rein to discuss the stuff in their endlessly engineering minds. If you have suggestions for a topic you'd like to see them cover, let them know in the comments! I am a nail polish enthusiast. 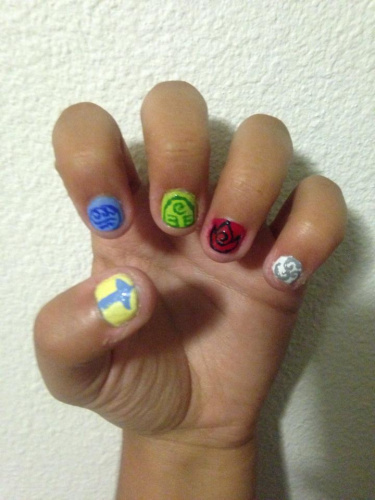 It started off as a way to cover my nails so that I stopped biting them, but it turned into a way to express my nerdy-ness in a cool and artistic way (that also stopped me from biting my nails). 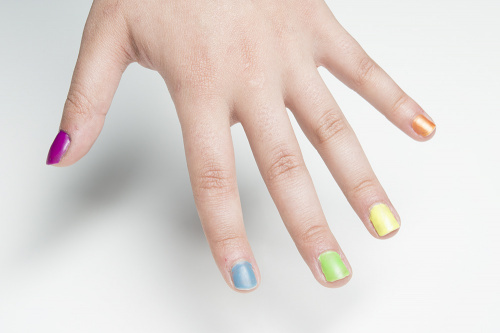 One of the new fads in nail polish is “gel” or “shellac” polish. These nail polishes differ in that they are cured, by UV light, into a plastic on your nails that supposedly lasts longer and doesn’t chip. 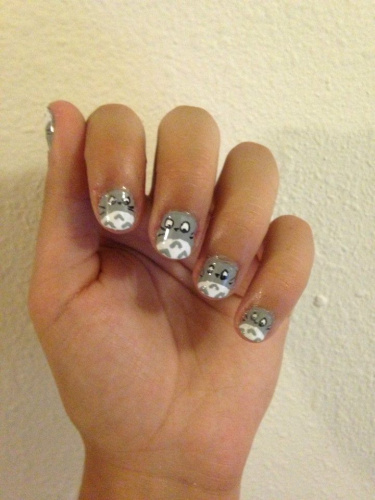 For a while they weren’t selling the nail polish itself, and you would have to go to a salon to get this done. 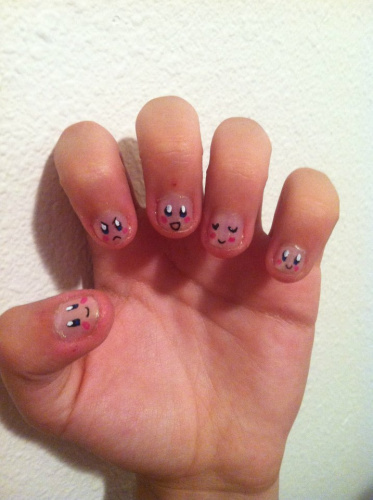 I never did, because that’s no fun, and I can’t tell a manicurist to put Kirby faces on my nails. So I waited. And sure enough these gel/shellac/lacquer polishes were available to buy. Cool, I wanted to try them. Problem was, they were selling the accompanying lamps for around $45. As an electrical engineer, that seems ridiculous to me. So I grabbed some UV LEDs from our stock, and I started testing. A short lesson in light: Visible light (what we see as things like red, green, blue and so on) is categorized by different wavelengths. 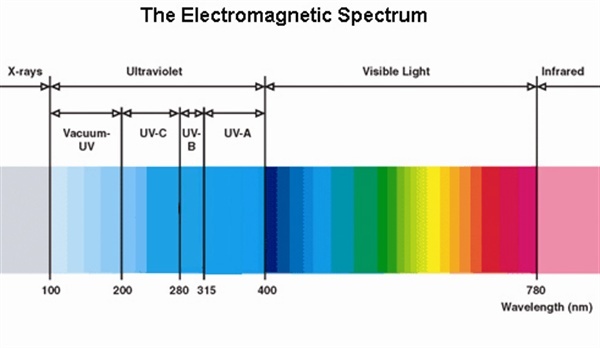 For example, what we see as green light is about 495-570 nm on the Electromagnetic Spectrum. All visible light ranges from about 400 nm (violet) to about 780 nm (red). Ultra Violet light (UV light) ranges from about 100 nm to 400 nm. As you can see in this graph, there are three main types of UV light: A, B and C.
I was curious if a 25 nm difference was large enough that the nail polish wouldn’t cure. Most gel nail polishes I saw had options for either UV LEDs or bulbs, and only the time to cure differed. I was pretty confident at this point that, regardless of the manufacturer, my “lamp” could cure the gel nail polish, even though it may take longer (say, a minute, as opposed to the 30 seconds it says it takes on the bottle). Just to be safe, the first nail polish I tested specifically said UV LED-cured, and was an all-in-one application (base coat, color and top coat) so I didn’t have to mess around with multiple coats. All the good things they say about gel nail polish are true. 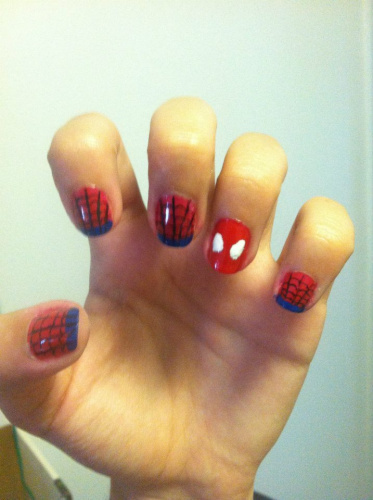 It has relatively little scent, unlike normal nail polish. It took about a minute and a half to cure instead of 30 seconds with my “lamp,” but that's still super fast compared to regular nail polish. My first tester lasted about two weeks before it started chipping and peeling, which was amazing. My one complaint about it is that it's harder to get off (which is what it's made for). If you don’t want to peel it off your fingers (which I do not suggest, as it took a small layer of my nail with it), you have to soak it off in a special alcohol mixture that I wouldn’t say was fun for my cuticles. Once I had experienced my first success with what I knew was probably going to work, I wanted to venture out and test more types. I was worried about different colors because they would need to use different photoinitiators, since some are slightly colored (usually yellow-ish). With a dark color like black I knew it would be easy, because they could use whatever photoinitiators work best since you wouldn’t really see it in the dark color. More specific lighter colors would take more specific photoinitiators, and could change what wavelength it needed. 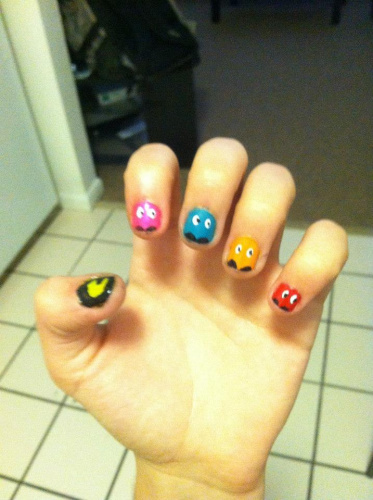 The instructions on these suggested using a base and top coat also, but I just put them on straight. They left a tacky layer once cured that you just wipe off with a cotton ball and some alcohol, but it made it hard for me to know when they were actually done curing. I cured them for about two minutes (could have been too long; I don’t know because of the tacky layer). 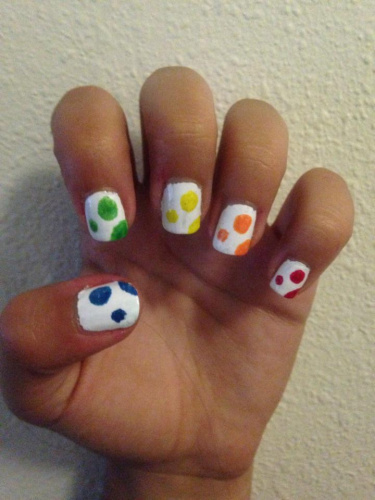 The lighter ones did take longer, and they weren’t shiny because that is what a top coat is for. But I like it; it worked all the same. These didn’t last as long, but I am assuming that is why they suggest a base coat. Gel nail polish is pretty cool. It takes care of all the things I didn’t like about regular nail polish, like the bad smell, the length of time it takes to dry and the fact that it wouldn’t even last a week on my nails, especially when I worked hard to make them super awesome. My UV LED lamp worked! It took longer to cure than it said it should on the nail polish bottle, but it was still way faster than normal nail polish. I am fine with it taking a minute or two longer since it is a fraction of the price to do myself than to buy a lamp or go to a salon. Even if I were to buy a lamp, it still wouldn’t work the same way for every different manufacturer's polish. Another cool thing about gel nail polish is that since you cure each layer separately, you can wipe off a new layer before you cure it without messing up the layer underneath. 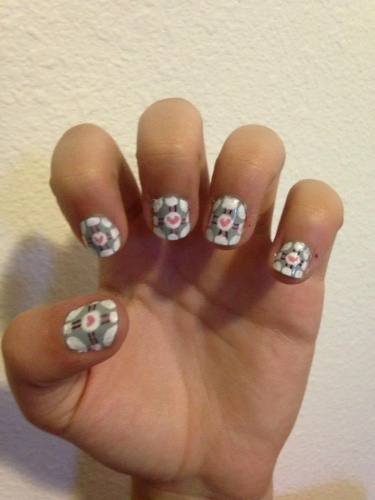 This makes my nail art way easier, and opens up cool new things that I may not have been able to do before. 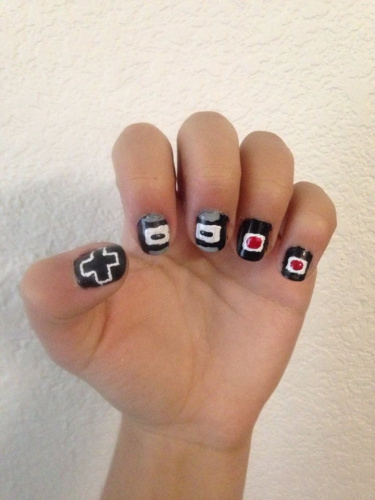 Extra nerdy gel nails, here I come! 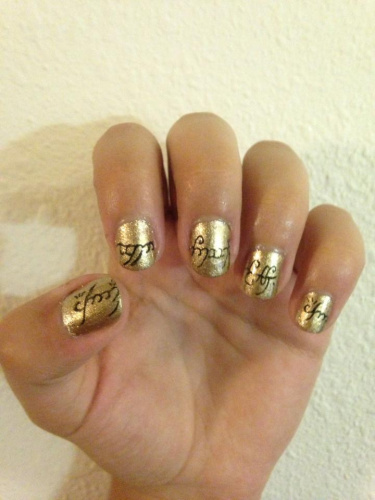 The lettering on the gold nails, Elvish script I assume? The inscription of the One Ring? Good detail work on it. There are some similar materials that cure down into the blue spectrum - I know some polymer dental fillings use a blue LED, for instance. Nice! Great designs. I might need to try the Totoro or Avatar flavs.